Join the discussion on our forums! 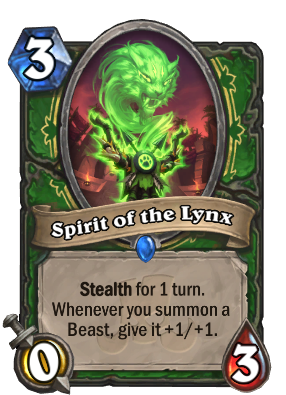 Come discuss Spirit of the Lynx over in our dedicated Spirit of the Lynx discussion topic. Much of this shrine’s power lies in the can-opener noise it makes. Potentially never played. Potentially very strong. Hard to fit into an archetype I've noticed. Seems to fit into a Beast deck but you don't want to dilute Master's Call. Will see if someone can find a home for this. Maybe after Duskbreaker rotates, although Hellfire is remains a big problem if Control Warlock is still a thing after rotation. This isn't Moonglade by the way. bad tempo play by itself, but we have so many rush and charge options at this point that It will probably work out. Just iimagine playing this on turn 4 against zoolock and then Unleash + Revenge of the wild. So many doggos, so many buffs. This is the strongest spirit by far simply because it has natural synergy with literally everything the class wants to do anyway. Unleash the Hounds just got a lot more interesting..
Nah, that's just the spirit of her boyfriend. Pretty nice, hunter really got the upper hand this time. Can't wait to see this in golden. Gives your Beasts that perfect 'overpowering' smell.